EB and WB reference markers on 3rd Ave. Extension in Rensselaer. 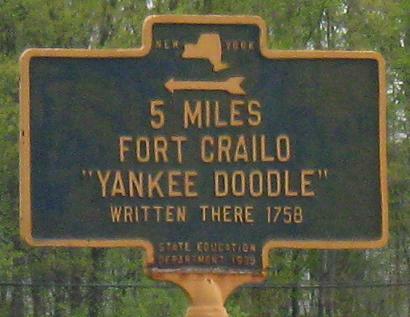 This was NY 43 until Exit 8 (originally reserved for a freeway connecting to the stubs on the Dunn Memorial Bridge) was constructed on I-90 to connect to the rest of NY 43 in Defreestville, stealing the designation away from this piece between US 9/20 and US 4. NYSDOT just looked the other way after that point. NY 43 crossed the original Dunn Memorial Bridge, but may or may not have continued to cross when it was replaced by the current version - NY 443 was created out of the western half of the route. This used to be the western terminus of NY 151, but when NY 43 moved it couldn't be left dangling, so it was extended west over the rest of former 43. And this is now NY 151 over the railroad on the south side of town instead of NY 43, seen looking south from a parking lot. The left arrow takes NY 43 EB traffic onto Rensselaer CR 55 WB. 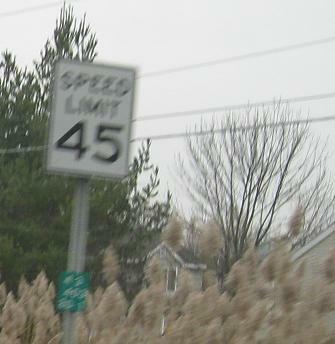 What's puzzling is this section of NY 43 was built fairly recently, so this sign must have been moved from elsewhere.